A violent street gang turned parts of Brooklyn into a war zone and used innocent bystanders as human shields, prosecutors say. Several alleged members are now facing charges. Erica Byfield reports. Nine alleged gang members, one just 15 years old, have been charged in a 69-count indictment in connection with seven separate shootings that left a young college student dead and injured more than a dozen other people, authorities announced Tuesday. 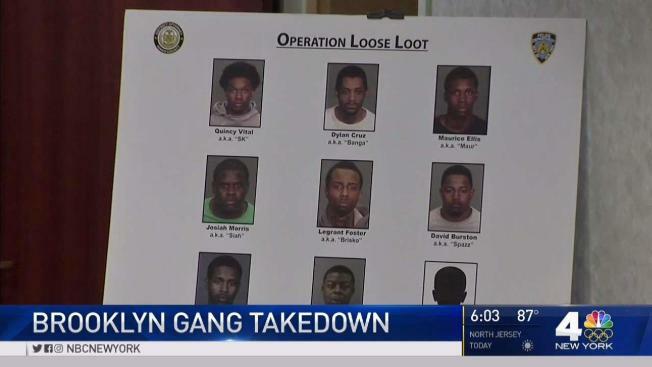 According to the indictment, the defendants, who range in age from 15 to 25, are alleged members of the Loot gang, which operates out of the New York City Housing Authority's Ocean Hill Houses in Brownsville. The indictment charges them in connection with 10 crimes, including seven shootings and one assault, between November 2015 and August 2016. Fourteen people were shot, one of them fatally. One person was beaten. The defendants mostly targeted rival gangs, including, on multiple occasions, shooting at members of True Bosses Only (TBO) in Bushwick, which is TBO territory, the indictment alleges. Shootings also occurred in Bedford-Stuyvesant, Fort Greene, Canarsie, and Jamaica, Queens. A woman is shot as an alleged gang member uses her as a human shield after a gunman busts in while she stands in line at Rico Chimi restaurant in Queens. In one instance, a 22-year-old John Jay College student with no gang affiliation was shot and killed after leaving a party to buy an iced tea, authorities said. 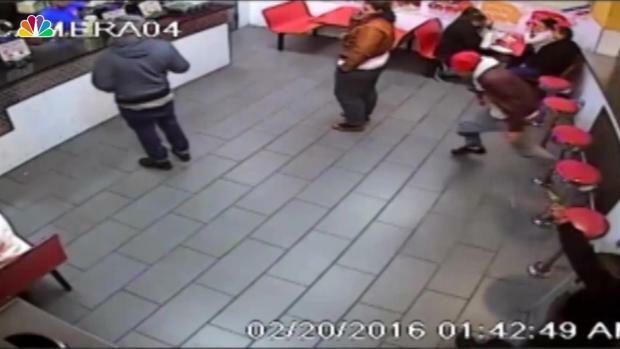 In another case, a rival gang member being shot at in a Queens restaurant grabbed a 33-year-old customer and held her in front of him in an effort to shield himself from the hail of bullets. She was shot three times in the leg. It is alleged that all of the shootings were committed when Loot members were “spinning the block,” driving through rival territory looking for rival gang members and using one or more of four "community guns" to try to take them out. The defendants allegedly conspired to commit crimes, including murder, assault and weapons possession, in order to maintain their dominance over their claimed geographic area, their social media presence and superior positioning among budding rap artists. Loot members allegedly used Facebook private messaging, as well as the calling feature available through Facebook messaging, along with text messages, phone calls and FaceTime to communicate about getting guns and ammunition and committing acts of violence against rival gangs. Loot used public Facebook postings and music videos posted to YouTube and SoundCloud to antagonize rival gang members, boast about previous acts of violence against rival gangs and show Loot loyalty through hand signs, clothing and lyrics, investigators say. It is alleged that at least one shooting, on November 27, 2015, was in retaliation for the shooting death of Armani Hankins, a.k.a., Rocky, in Fort Greene, a month earlier. The victim was allegedly a friend of some of the Loot members and they released a rap music video entitled “Rockyworld” on YouTube, a song about retaliation against a gang known as 900, for his death, according to the indictment. The suspects face varying charges, including conspiracy, murder, attempted murder, gang assault and other crimes. They face up to 25 years in prison on the top conspiracy count. "This indictment illustrates how law enforcement is taking a strong stance against violent gang members who commit these heinous acts of senseless violence against innocent victims," added NYPD Commissioner James O'Neill. "We stand with our local law enforcement partners ready to identify, investigate and arrest those who are at the root of crime and collateral damage in our neighborhoods."